DC Janelle and her rescue dog Murkin have fostered several litters of kittens, delighting video viewers along the way. Now they’ve given a CH kitten a loving home. YouTube video creator dcjanelle and her sweet and patient dog Murkin have fostered several litters of kittens for their local shelter, delighting viewers along the way. Dcjanelle recently adopted a special kitten, a spunky fellow with CH (Cerebellar Hypoplasia). CH kitties are often called “Wobbly kitties”, for their wobbling gait. The new kitten is introduced to viewers in the first video. In the second, we share the moment when kitty is introduced to Murkin for the first time. Rupert Wobblepants is a very special kitten that Murkin and I adopted. He has a condition called Cerebellar Hypoplasia. Its caused by a virus that infected his mother while she was pregnant, and it causes the cerebellum part of the brain to not develop properly. This causes the affected kittens to be clumsier than usual, but it causes them no pain. He also has a congenital heart defect, which we are currently in the process of treating. About Murkin: Murkin is a shelter dog! He was born in 2003 and we think he is a great pyrenees/lab/golden retriever/australian shepherd mix. I adopted him from our local shelter when he was about 6 months old. He is very calm and patient, and he loves to hang out and play with other animals, especially cats and kittens. I foster kittens for our local animal shelter. Rupert Giles Wobblepants (aka Wobblepants) finally gets to meet Murkin! The first time he saw him, he was not scared at all! He immediately wanted to play. Ed. note: Kitty takes a tumble onto the rug in the following video, which we wish didn’t happen but is a fact of life with any kitten learning his way in the world, not just those with CH. 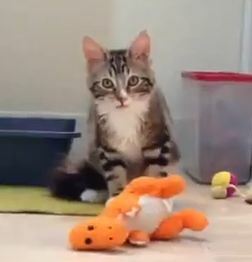 For more videos with Murkin and some of his foster kitten buddies at our site, click HERE. I found your web site researching CH. A teen friend gave me a 8 week (close estimate) old kitten she found in the engine compartment of a junked car she was allergic to. Onyx looks very similar to R.G. Wobblepants but with more controlled motor skills. That was 5 months ago. I’m convinced he has CH. At 7 months Onyx is a very sweet, affectionate kitten that doesn’t walk very much, climbs mostly, but when he wants to he has a very fast scamper. Zip Fast! He rarely ever stands, sits more like a rabbit statue and comes with a ‘broken squeaker’ (he’s 98% mute). His back hips sway when he walks, his left leg seemingly a tad weaker, creates an odd, slow gate. He recently leaped onto my bed, which was quite pleasing to know he has that capability. He did it with a running start. My question is: Are there exercises, therapies, and ways of playing that can help better develop a cat with CH? I’ve have a very special supplement I recently began to give Ginger that has turned her from being a cat in hiding sleeping most of the day back to when she was a younger cat. Pretty amazing. I’m going to experiment giving it to Onyx and see if there is any, if not noticeable improvements in his symptoms and motor skills. Do you have any advice for me that will help Onyx as he grows?